The unprecedented rise of co-working from concept to reality has been well-documented to say to the least. From waxing lyrical about the benefits, to exploring the practicalities and complexities of establishing such communities, much of the commentary to date has focused on the impetus for creating these spaces in the context of property, business and consumer behaviour. The diversification of the workplace offering has also led many to question the narrative of what fundamental ingredients are required to establish an inspiring office environment, and more importantly, what we expect and essentially need from our place of work. Beyond bricks and mortar, co-working has irrevocably altered how the workplace will forever be utilised. As with any empire, commentators will often look to prescribe an expiry date to such cultural change. One only need look at WeWork’s expansion to question the sustainability of such initiatives when set against the backdrop of political and economic uncertainty and the inevitable evolution of the workforce. By 2020 it is forecast that millennials will make up 35 per cent of the global workforce, and with 7 out of 10 Millennials believing that the quality of the workplace is a pivotal factor in their job hunt, the industry will have to remain adaptive to weather the changes in workplace demography and culture. As the discourse surrounding co-working and its future develops, it is only natural for those in the field to explore the ways in which they can differentiate themselves and act as trailblazers in what some regard as a saturated industry. One such person is Aaron Ezair of Northern Group and Co-Founder of Colony co-working. Described as a co-working space for “thinkers, doers, creators”, colony is relatively new, their Ancoats space based at Jactin House opened in 2017, but is already positioning itself as vehicle for change, acting as an, “observer and facilitator” not only for their members, but in the interests of the wider Manchester community. Born and bred in Manchester, Aaron and Ancoats Community Manager, Alex Campbell’s long-term friendship and enduring creative partnership has manifested itself in the curation of Colony, an inspiring and thoughtful approach to co-working, where collaboration and community are able to flourish thanks to their hands-on approach and shared vision for the future of the workplace. With the fourth-highest digital turnover in the UK, Manchester is the ideal location to sew the seeds of Aaron’s Colony vision. With a history on innovation and enterprise, he is excited to be part of a wider movement of change and regeneration taking place across the city. With Ancoats major player status essentially confirmed by Time Out magazine’s inclusion of the quarter in its list of the world’s 50 coolest neighbourhoods, a great deal of attention has been paid to this burgeoning cultural hotspot, however, just a stone's throw away at Piccadilly Place, there is notable feeling of change in the air. It is no coincidence that Aaron chose to base his second co-working space at Piccadilly, “its a sleeping giant, the gateway to the city.” Both Kampus and the London Road Fire Station developments are in the works here, further cementing Aaron’s belief that Piccadilly is ripe for change and investment, despite being regarded as a somewhat underrated area of the city. A hotchpotch of architecture and purpose, Alex also believes that the area is earmarked for change, and is useful for Colony’s members who can interchange between the Ancoats and Piccadilly sites, signalling an nuanced understanding of the diversity of their network and the varied working habits and preferences of the Manchester community as a whole. Much like the petri dish that inspires their name, the growth of Colony is dependent upon the ingredients and interactions that exist and take place within their spaces. Providing a launchpad for start-ups, entrepreneurs and small business, as well as fostering unlikely collaborations and partnerships between members, their approach has been instrumental in enabling ideas to pollinate within their community and for entrepreneurial pathways to be pursued. Part observer, part facilitator, for Aaron the evolution of Colony is about providing the means for individuals to feel empowered, especially those embarking on a new venture or career journey. Beyond the aesthetic, which in Colony’s case is a subtle balance between relaxed and productive, the aim was to create a space where their members could quite simply get the job done, while simultaneously being safe in the knowledge that they had the support and encouragement of the Colony founder and his team. While Aaron is happy to let the spaces develop their own sense of community, he has been more than willing to take risks that he feels his membership will be receptive to and that work to foster co-cultures, a case in point being the team spaces at Piccadilly, and the collaboration zones at Jactin House. Likewise, their event series reflect the Manchester communities that they have integrated themselves within, inviting organisations such as Pechakucha and Ladies Wine and Design, which in turn deepens the micro-cultures that are beginning to flourish within the Colony spaces. Nurturing genuine connections with their membership seems to be the differentiator for Colony, unafraid to put a face to the name in their exploration of what consumers want from a co-working space, they take a flexible approach while making sure to embed their values and ethos in what is stereotypically a changeable environment; such is the nature of shared office space. Looking to the future, plans for workshops, podcast booths, photography suites and post-production facilities are in development as Aaron looks to remain agile and aware of his members diverse needs and requirements. While the expansion of Colony is something that Aaron is pursuing, his primary focus is to ensure that his concept grows authentically with the same ideals and sense of community that the Manchester initiative was built upon. Having a presence in certain pockets of Manchester and augmenting the area that they are a part of developing, so that these spaces are accessible to everyone with dreams, may sound like a tall order, but one that I am sure they will uphold as they keep their eyes on the changing face of the workplace and the shifting needs of the modern day worker. 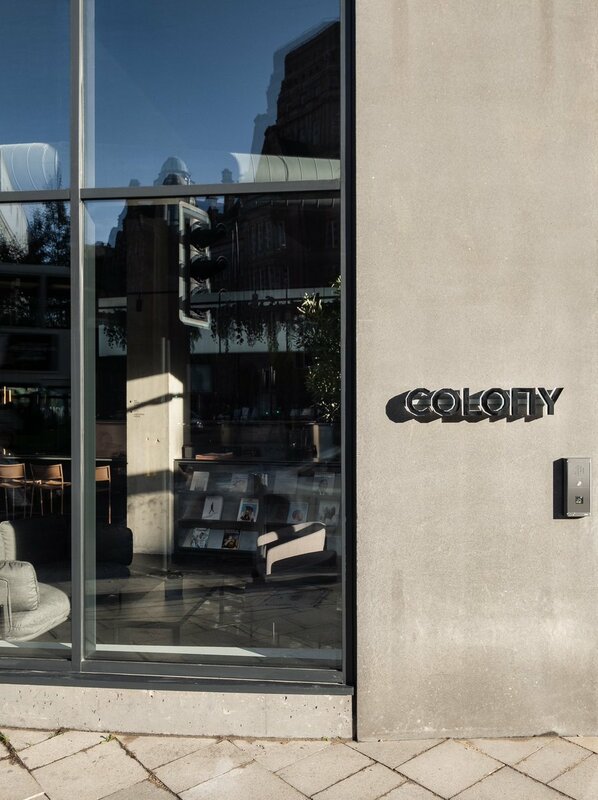 To find out more about Colony and their spaces across Manchester, make sure to visit their site.